A circus that entertains the public during the International Circus Festival of Castilla y León. The International Circus Festival of Castilla y León, 'Cir & Co' returns in the city of Ávila from August 28 to September 2. On the occasion of this edition, the sixth, there will be more than 160 activities, in charge of 32 companies of 14 nationalities. Another year has been presented the program of the VI International Festival of Circus of Castilla y León , 'Cir & Co 2018', which will be held in the city of Ávila from August 28 to September 2. The presentation was attended by the Mayor of Ávila, José Luis Rivas, and the President of the European Federation of Professional Circus Schools, Donald Lehn. The sixth edition presents a change of dates, thinking about families and the prolongation of summer, before school starts, with a program designed to be enjoyed by the family. In the presentation, held at the Verdugo de Ávila palace, the program of the sixth edition of 'Cir & Co', which has more than 160 activities , has been announced, through the participation of 32 artistic companies from up to 14 nationalities, six more than in the last edition. Sancho pointed out that Cir & Co 'has become a leading reference for circus arts internationally and the main festival of its kind in Spain, with an increase "both in quality and quantity, with new spaces, new sections and more activities". This edition also the Festival 'Cir & Co' continues to grow incorporating new scenic spaces. In this sense, the cloister of the Monastery of Santa Ana , current headquarters of the Territorial Delegation of the Junta de Castilla y León in Ávila, will host on Thursday, August 30, the new section 'Circus Music', with the show 'En Concierto' , from the Belgian company 'Belcirque'. A new space and a new section that add to different activities parallel to the festival, adding more professional proposals and allowing the interaction of the public, such as the 'Reflection Workshop on the Ephemeral Architecture and Urban Community Design from the perspective of the Circus' , which has been organized with the collaboration of the Official College of Architects of Ávila. In addition, the Federation of Hotel Business Owners of Ávila maintains its collaboration and involvement with the 'Cir & Co' festival, adding new initiatives, such as the ' Audience Award for the Best Show ', which will be held for the first time in this edition. The programming of 'Cir & Co 2018' maintains fixed sections of the festival, such as 'Cir & Co Acrobático' in the plazas del Grande and El Chico, the activities of 'Cir & Co Clásico', aimed at the youngest, in the surroundings of the Cathedral and the plaza of Adolfo Suárez. 'Cir & Co Selección' will combine heritage and performing arts in the Aboriginal palaces of Verdugo, Bracamonte and Superunda-Caprotti, which joined the festival last year, within the 'Cir & Co Carpa' section, and which this year will stage the show 'Dékoncert' , from the French company 'Solfasirc'. 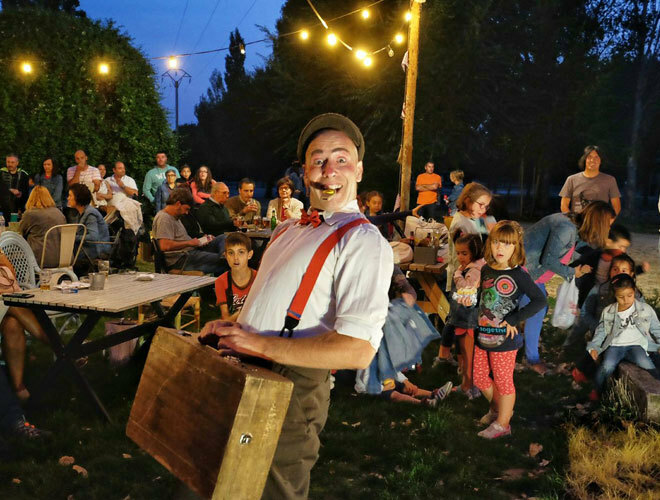 In addition, in this same section, the tent of the atrium of San Isidro, will host the new renovated show of the Swiss company 'Nicole et Martin', with adaptations of stories for a family audience. The parades and fanfares will once again sound through the streets of Ávila to the rhythm of the French companies 'Les Transformateurs Acoustiques' and 'Zykatok' in 'Cir & Co Sounds', while the 'Cir & Co Cine' section, created last year, will transform the hillside of the wall in an open-air cinema , where the films 'Trapeze' (USA 1956), 'The Circus' (USA 1928) and 'Madagascar 3: March for Europe' (USA 2012) will be screened. In addition, the programming of 'Cir & Co 2018' bets on sections that are a benchmark of the festival and that have as their objective the involvement of the entire city of Ávila, such as 'Cir & Co Social' with a program in the Residential Centers of Ávila, within the commitment for the culture for all and betting on the circus as a tool for transformation and social inclusion. And with sections such as 'Spaces with Noses', with small format performances and in hotel establishments in the city, combining gastronomy and scenic arts , thanks to the collaboration of the Federation of Hotel Business Owners of Ávila.